My friend Rocca and I recently bought a case of Ataulfo mangoes at Fruit King on the Danforth. The case held 16 mangoes and cost a lowly eight bucks. I let my mangoes all ripen at room temperature then refrigerated them, for longer storage. I suspect Rocca still has plenty of mangoes in her kitchen, too and that’s why she’s asking for this recipe. It is dead-easy, folks! You make the coconut sauce then pour it over cooked sticky rice (that recipe is found at the end of the Wondrous Larb Gai post) then let it sit and soak up the flavour. Mangoes are my favourite fruit and Mexican mangoes are pouring into Toronto produce stores right now. There are four main types to look for. Ataulfo: These vibrant yellow, kidney-shaped mangoes are prized for their creamy texture and lack of fibres. Little known fact: This fruit inspired the British paisley pattern. Look for small wrinkles in the skin and a deep golden yellow colour when ripe. Haden: This medium to large mango with its oval to round shape is bright red with green and yellow overtones and small white dots. Fine fibres are in the firm, aromatic flesh. Keitt: This large oval mango is dark to medium green and sometimes has a pink blush over a small portion of its skin. It has juicy flesh with limited fibres. Tommy Atkins: A dark red blush often covers much of this fruit with green and orange-yellow accents. It’s the mildest mango of the bunch and the flesh is fibrous. I first tasted this sweet snack in an open-air market in Chiang Mai in Northern Thailand. Soon I was a regular at the stall that doled out this addictive combination wrapped in an ecologically friendly banana leaf. In a medium bowl, cover sticky rice with 4 inches of water. Soak 4 hours minimum and up to 16 max. In a small pot on high heat, bring coconut milk to then reduce to med-low and simmer, uncovered for 25 minutes or until reduced by one-quarter. Add sugar and salt. Mix well and allow to cool. Meanwhile, arrange sticky rice in a single layer in a bamboo steamer lined with parchment paper (punctured with a few air vent holes) or cheesecloth. Place over a wok or large pot filled with boiling water. (The boiling water should not touch the steamer. Allow for at least a few inches.) Cover and steam with water boiling at medium for 25-30 minutes or until the rice becomes shiny and is tender to the bite. Peel mangoes. Cut mango “cheeks” so that you have 2 halves cut close to the mango pit. Place a mango half on cutting board and slice crosswise to create 1/4-inch slices. 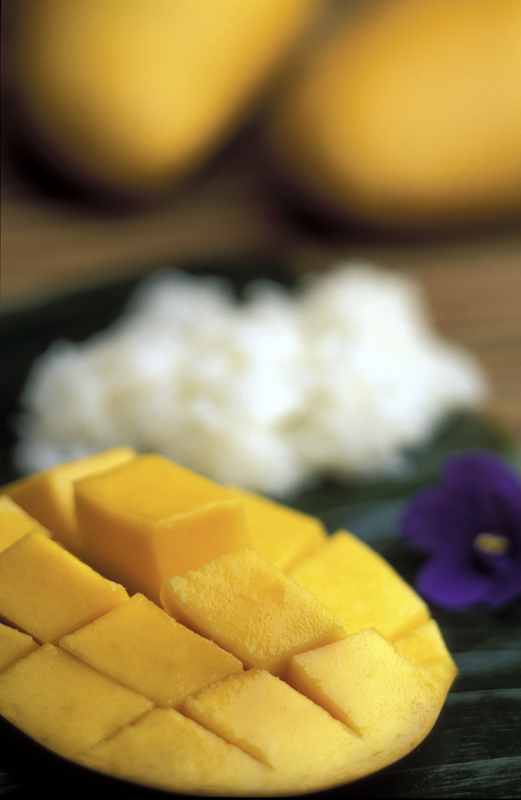 Serve each portion of rice with half a mango (in slices) on top. Garnish with fresh mint leaves if desired. This entry was posted in Ingredients, Photos by Donald Nausbaum, Recipes. Bookmark the permalink.